A+Awards: next in our series of 2016 Architizer A+Award winners is a swimming pool in the Iranian capital, with a concrete pavilion by architects KRDS at one end to provide a changing room and spa facilities. 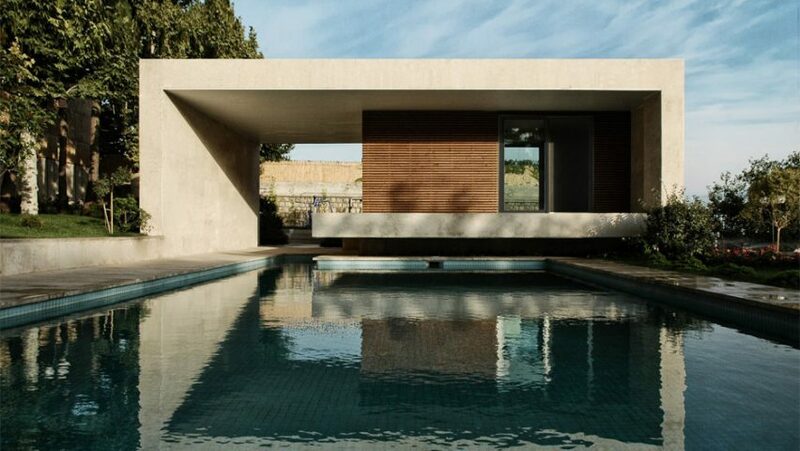 Kourosh Rafiey Architectural Design Studio (KRDS) designed the Sohanak Swimming Pool and adjacent structure for a private garden in Tehran – a city where contemporary architecture is booming, now that crippling economic sanctions have been lifted. 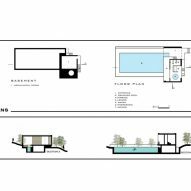 The client wanted a place to swim and relax close to the house, but the architects convinced him that it made more sense to convert an old irrigation pond in the middle of the site. To provide changing facilities and showers away from the home, a concrete pavilion was constructed at one end of the rectangular pool. It also accommodates a hot tub and a sauna. "Since this building is exactly on the main axes of the garden, we designed it as a kiosk – a kind of building in Iranian traditional gardens," said KRDS. 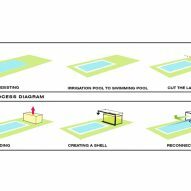 "There are some parameters that distinguish a kiosk from other buildings: four facades, a void in main facade, and reflection of the building image on water surface." Taking all of these elements into account, the firm designed a concrete frame that wraps around to form a cuboid shape with two open sides. A passage through the pavilion is set to one side, where a short flight of steps leads up to a terrace. The concrete slab overhangs the water, and can be used as a diving platform. The changing and spa facilities are accessed through sliding glass doors, which provide views of the garden from the hot tub. Thin wooden slats clad the remaining front of the enclosed area. Hidden beneath the volume is a mechanical rooms that houses the equipment needed to keep the pool heated and clean, and run the jacuzzi and sauna above. Overall, KRDS wanted the natural and built elements of the site to complement each other. "The reflection of the building on the water surface emphasises the connection between architecture and the nature," said the firm. The Sohanak Swimming Pool was completed in 2014, and was the Popular Winner in Sport & Recreation category at the 2016 A+Awards.